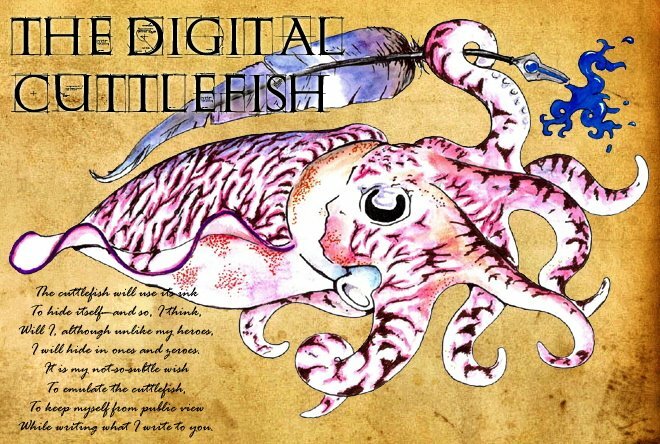 The Digital Cuttlefish: I'm In Love! I like my food spicy; some like their food bland. I like an adventure; some want their lives planned. While others want someone whom they can command. Which grows every day, and in truth, every hour. Like some I could name, though that’s not unexpected. Who wear on their sleeves scientific desires. The woman I love is a beauty called Science. What... you want context? Ok, here. Hey, it's Mr.Man. I post here firstly to,again, applaud your work and secondly to ask if it's alright for me to repost it on my own blog and if so, how (i.e. if it's alright to post the full poem, with link or the link alone)? Feel free to post the whole thing, with a link. "Who wear on their sleeves scientific desires." I hate to critique such an awesome poem, but I did find this one line a little tepid, compared to the rest. What are 'scientific desires'? It seems an odd juxtaposition to me. "Her sparks light the mind with Promethean fires"
Where In The World Was Digital Cuttlefish? Good News On The Parasitic Worm Front! Church Vs. Virus--Who Will Blink? Get off yer arses and vote!